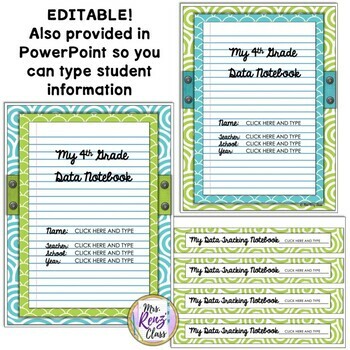 This is a cute and color coordinated editable set of editable 4th grade data notebook covers, backs, and spines for both students and teachers. Editable! Customize using the editable PowerPoint slides to type your information. (28 pages of slides). 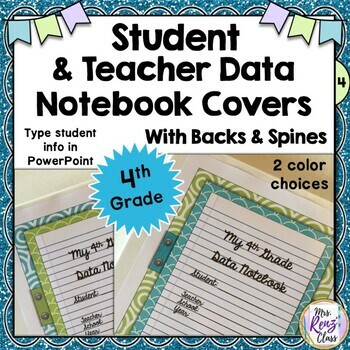 Add your own data tracking pages and display them with these beautiful covers, backs, and spines. If you're interested in a Common Core math student data set that includes a student flip book in I Can language, I Can posters, Graphs by domain to chart progress, and more!. The bundled set includes these book covers!